Sometimes it’s tough to decide in between two because things are too perfect. Oral-B and Sonicare are two toothbrush lines that are beyond perfect in their own ways. Evidently, they are the brands to beat in the toothbrush industry. The US National Consumer Survey, 2016 states around 8.7 million and 5.02 million people use Oral-B and Sonicare respectively in the US. For the stat, it is clear more people lean toward Oral-B for their preference in electric toothbrushes. The only reason that came out of my analysis is the relatively cheaper price of Oral-B toothbrushes. Both Oral-B and Sonicare have never stepped back when it comes to adoption of technology. They are doing just the same with their latest releases as well. The major reason new releases are successful is the appreciation of the consumers. Dentists recommend both the brands highly. In this article, I will enlighten you about the differences between Oral-B and Sonicare. You will also find a handy comparison chart and I will tell you the specific qualities that separate the models form one another. The Sonicare brushes have a more natural look than the Oral-B brushes. These brushes look almost like the regular toothbrushes that we have used since time immemorial. Braun Oral-B electric brushes look more modern and come with many additional features. As far as ergonomics is concerned, the Philips Sonicare brushes are more ergonomic than the Oral-B. Oral B brushes brush heads have more variety than Philips Sonicare brush heads. Usually, the Oral-B toothbrush heads are bigger than the heads of the Sonicare toothbrushes. Sonicare toothbrush heads look more like the ordinary toothbrush heads. The relatively smaller size of the Sonicare toothbrush heads makes it easier for the users to brush difficult-to-reach areas. Each of the two electric toothbrushes has a very unique brush movement. While the Sonicare models use high velocity lateral vibration movements, Oral-B toothbrushes are known for their rotating and oscillating brush strokes. Some of the Oral-B models can rotate more than 40,000 times/minute, while the top-end models of Sonicare can produce 31,000 strokes per minute. Both the Sonicare and Oral-B brushes have different modes. Oral-B electric brushes have more brushing modes compared to the Sonicare ones. 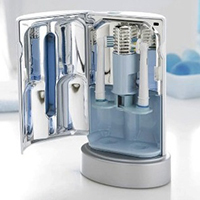 Philips Diamond Clean comes with five different brush modes, while Oral-B Black 7000, the most advanced model of Oral-B, offers six brushing modes. It should be noted that Oral-B brushes are a bit noisier than the Sonicare brushes. 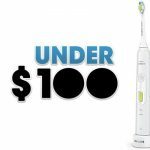 Sonicare brushes are bit more expensive than the Oral-B brushes in general, even when both manufacture electric toothbrush models under $50. 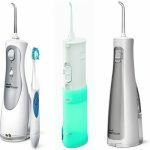 Though Oral-B brushes offer more customization options when it comes to brushing heads and are more sophisticated electric toothbrushes, they cost considerably less than the Philips Sonicare brushes. However, one must take into consideration the fact that Sonicare brushes give more natural feel to the users. The key difference between the Sonicare and Oral-B toothbrushes is in the technologies they use. While the Sonicare brushes use vibration technology, the Oral-B models use a rotation-oscillation movement. The rotation-oscillation movement is also referred as Rotary technology. The 3D rotary technology found in the high-end models of Oral-B use as much as 40,000 pulsations, while the 2D rotary technology powered models produce much less pulsation. The pressure sensor may come handy if you are brushing so hard that you might hurt your teeth and gum. The sensor alerts users during such situations. 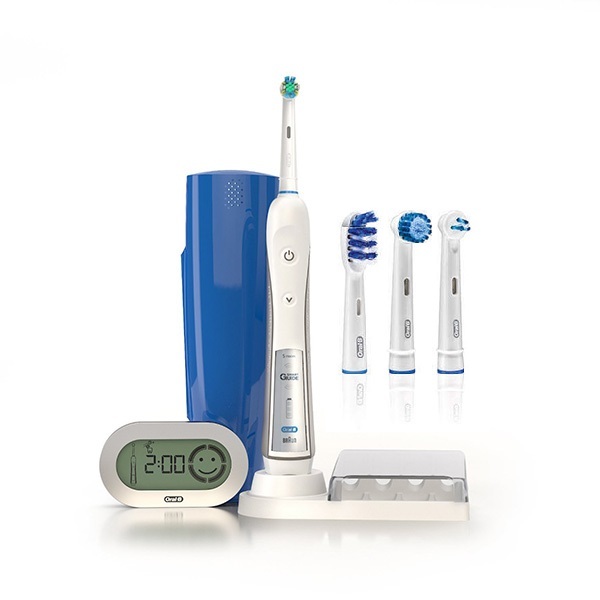 Except the Vitality Series brushes and the Deep Sweep 1000 model, all other Oral-B models are equipped with sensors. 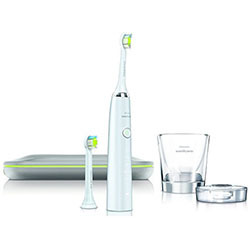 Only one model of Philips Sonicare has a built-in sensor. The Sonicare brushes have usually longer battery life than the Oral-B brushes. Some of the most sophisticated models have three weeks of average battery life. On the contrary, the most advanced model of Oral-B has a battery life of only ten days. Sonicare brushes support both 110V and 220V, which makes it easier for non-US users to use them. Oral-B brushes only support 110V. Oral-B toothbrushes leave Sonicare products much behind when it comes to using Bluetooth technology. At present, three Oral-B models support Bluetooth technology. The technology helps users to track their oral care progress quite easily. The models that currently use the technology are Deep Sweep 5000, Pro 5000 and Oral-B black 7000. Philips is yet to come up with Bluetooth enabled Sonicare toothbrushes. 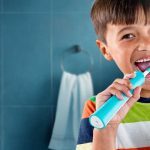 This technology can only be found in Philips Sonicare toothbrushes, more precisely, in only one Sonicare model – the Philips Sonicare Diamond Clean, a top electric toothbrush for travelling. The product comes with a charging glass and a USB charger travel case. The dual charging system is great for users who travel a lot and charge their brushes while on the go. The UV sanitizer is yet another great feature pioneered by Philips Sonicare. While normal washing cannot clean all the micro-organisms after each brushing session, the UV sanitizer annihilates the microorganisms from the brush head and makes the brush head completely hygienic again. While traditional surgical-grade tongue cleaning devices are highly effective for cleaning the tongue, Oral-B 7000can quickly switch to the tongue cleaning mode to enable users to clean their tongue. This is the only model that comes with tongue cleaning mode. No Sonicare model comes with this feature. 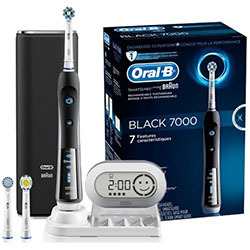 The Oral-B Pro 7000 Smartseries Black Electronic Power Toothbrush is the first ever electric toothbrush to have Bluetooth connectivity which means you can connect it to your Smartphone and track your oral care progress. The brush can give you feedback in real time through the Oral-B app. The app works great in guiding you to brush the most important (yet most neglected) areas of your mouth. Besides, it can track your brushing habits and come up with effective oral care tips at regular intervals. The brush also has a pressure sensor that alerts you when you brush too hard. The Oral-B Pro 7000 electric brush has a round brush head that has angled bristles for precise brushing. Add to it the top-notch 3D cleaning oscillates, pulsates and rotates and you get a product that can help you remove unwanted plaques better than any other product. The brush has six operating modes, namely gum care, daily clean, whitening, deep cleaning, sensitive and tongue cleaning. Comes with six different modes. Pressure sensor included to avoid hard-brushing. Bluetooth enabled device with a Smartphone app for easy tracking. Round brush head that comes with perfectly angled bristles. Battery takes too long to charge. Cleaning modes don’t have much differences. 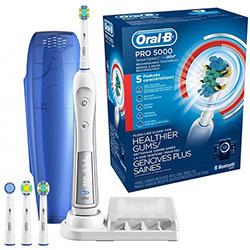 Oral-B Professional Healthy Clean and Floss Action Precision toothbrush is one of the most sophisticated rechargeable toothbrushes from the same manufacturer. The floss action bristles are meant for deep cleaning while the five different cleaning modes make room for precision brushing. The toothbrush can remove up to 99.7% plaque and is highly effective in cleaning tighter corners inside the mouth. The brush head also comes with an indicator that fades away to indicate that a replacement is needed. Like many other Oral-B products, this one also comes with a pressure sensor that alerts users if they press their teeth too hard. The handle is waterproof and ergonomically designed. The five different cleaning modes are Daily Clean, Sensitive, Deep Clean, Massage and Whitening. The handle also has a charge-level display. The product comes with a portable charging station and a travel case. The product is versatile by nature and supports different brushing styles. Scientifically made bristles and good rotation speed. Reaches areas that cannot be reached by ordinary toothbrushes. Induction charger staves off chances of water damage. Quite a noisy electric toothbrush. 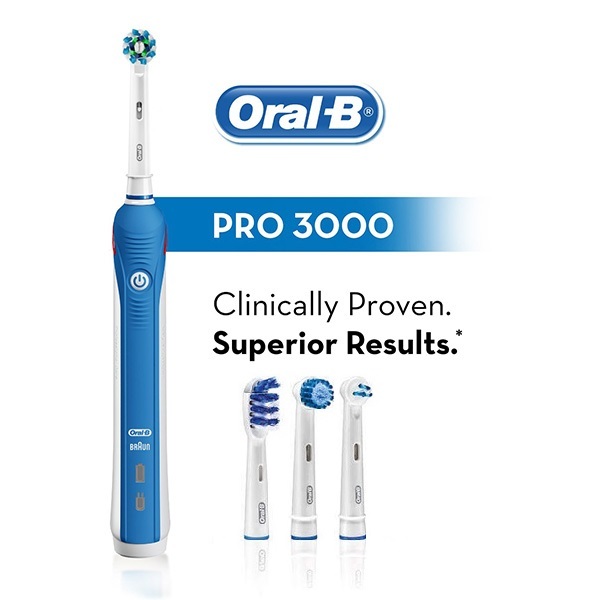 The Oral-B Pro 3000 series toothbrush can remove up to 97% of unwanted plaque. The toothbrush provides a 360-degree cleaning solution which has been clinically proven effective. 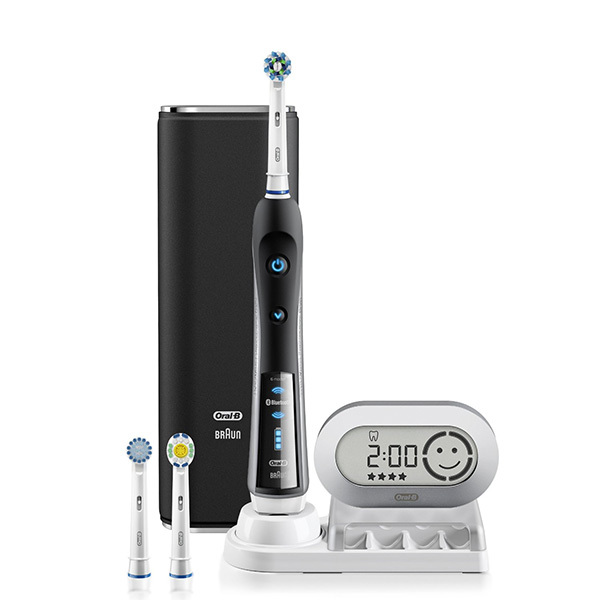 It is a mid-range electric toothbrush with all the features of the Oral-B Pro 300 model, plus a pressure sensor and two more brushing modes. The bristles are so well placed that you need little or no effort to skim the surface of your teeth. The slim and ergonomically designed brush makes brushing a breeze with minimum hand movements. You can find three cleaning modes in this toothbrush. Te brush is completely water resistant and you can easily use it in shower. The vibrating-oscillating brush has a robust design and can be used for four years or even more. The built-in quad pacer is actually beneficial for people who are quite used to quick brushing. 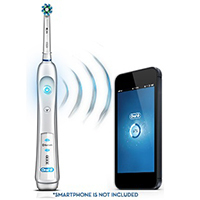 The sound connectivity option is for the Smartphone users who would be downloading and using the app for tracking oral care. Three different cleaning modes ensuring advanced oral care. A slim and easy-to-hold brush. Press sensor included so that hard brushing can be stopped immediately. Timer helps in precision cleaning. Battery indicator does not work until the battery is about to sleep. 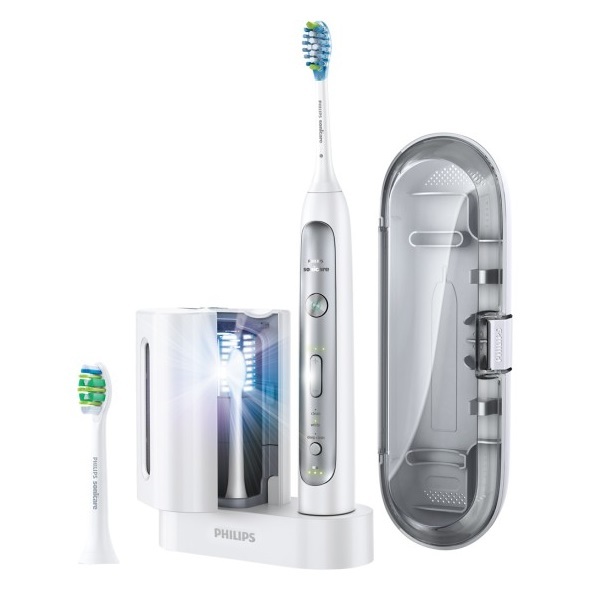 The Phillips Sonicare DiamondClean is undoubtedly one of the most advanced models that Philips had to offer and its performance and features justify the high price of the product quite nicely. The electric brush comes with a drinking style charging station which is indeed a very cool feature of this electric toothbrush. The brush feels almost like a pressure washer. The Philips toothbrush is ideal for new users who are just switching from manual brushing to electric brushing. The brush starts cleaning quite gently and gradually increases the power. However, if your gums are too soft for regular cleaning, you can switch to the sensitive mode for extra-gentle brushing. The product is the only electric toothbrush that comes with a USB charger, making it an ideal, if not natural choice for the travelers. There’s also a ‘Polish’ mode included so that you can brush and brighten up your front row teeth just before you go out. Brush is extremely gentle and includes five cleaning modes. Slim brush which is easy to handle and operate. Lightweight brush with great battery life. Battery life indicator is hard to find when battery is low. One of the costliest electric toothbrushes. The Philips Sonicare Flexcare toothbrush has ten times greater plaque removal capability than an ordinary manual toothbrush. It comes with a responsive and adaptive brush head that has a built-in pressure sensor as well. There are nine different brushing modes, including three intensity settings and three cleaning modes. If you are particularly concerned about gum health, choose this toothbrush as the revolutionary sonic action can provide gentle yet effective cleaning to your gums. The AdaptiveClean brush head easily reaches the hard-to-reach areas of your mouth. The brush also features one Quadpacer and a timer. The InterCare brush also prevents bleeding and gum irradiation. You can only change the modes when the brush is switched off. The brush produces 31,000 strokes per minutes, which is the best-in-class stroke frequency. The Lithium Ion battery can last up to three weeks when fully charges. 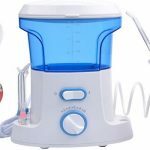 With all these features combined, the Sonicare Flexcare is one of the best electric toothbrushes on the market at this moment, if not the best. Sonic technology works best in sending cleaning fluids into the tight gaps between the teeth. Smartimer and Quadpacer included for precision brushing. Pressure sensor vibrates the handle quite gently if the press is too hard. Price is a big turn-off for many buyers. Toothbrush is not easy to hold. 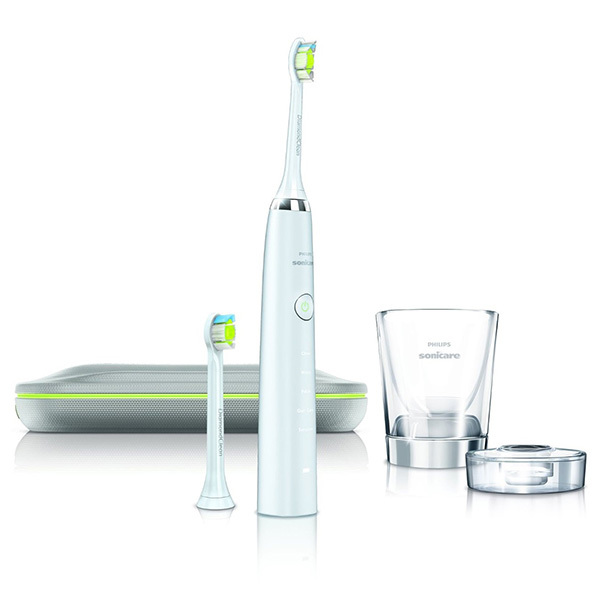 The Philips Sonicare HealthyWhite+ removes stains almost the double of any manual toothbrush. If you are worried about your stained and yellow teeth, this one can be your best bet for reclaiming the lost whiteness of your teeth. Besides bringing back the desired whiteness, it can also improve your gum’s health in about two weeks. The sonic technology, which powers many Sonicare high-end models, enables the brush to produce 31,000 strokes every minute. 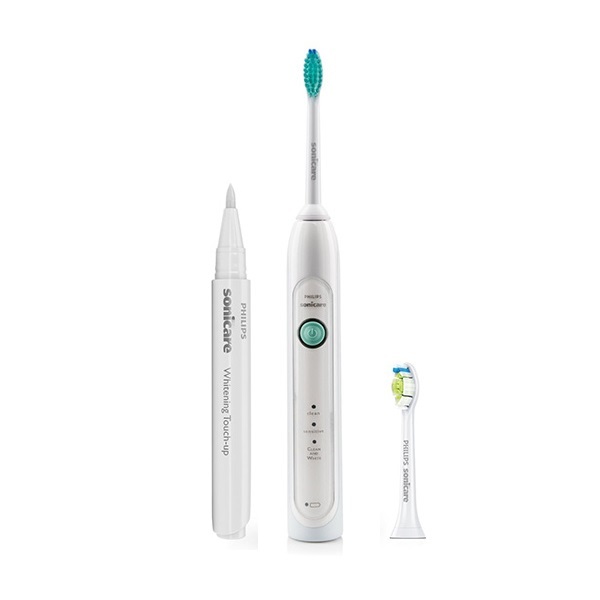 You can find six easy-to-switch-between modes for brushing in this electric toothbrush. The different cleaning modes actually help the users to clean their teeth thoroughly yet quite comfortably. 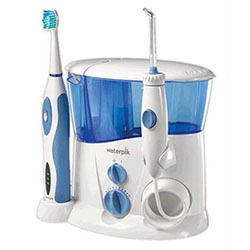 Besides, the Quadpacer and the Smartimer helps in precision teeth cleaning. The brush can remove plaques seven times faster and better than the manual toothbrushes. The diamond shaped bristles actually help in faster plaque removal. The battery life is three weeks, which is quite longer than the battery life of any other product in this category. Completely safe to use on dental implants (Warning: brush heads may wear out sooner than usual). Way better cleaner and plaque remover than a manual toothbrush. Cost of replacement blades is quite high. Healthywhite is a misnomer: it is not really an alternative to deep flossing and clinically proven whitening procedures. Dr. Robert Hutson, a dentist from California, designed a toothbrush back in 1950 and the product got patented in the same year. In 1958, he patented another product, which he named as ‘mouthbrush’. This new invention looked pretty similar to its predecessor. The inventor claimed that the new toothbrush was more effective in massaging the gums. He also coined the brand name – Oral-B. The first ever product of the Oral-B family was Oral-B 60. However, Dr. Hutson sold the rights of his business in the 60s and the brand was taken over by Gillette Group. 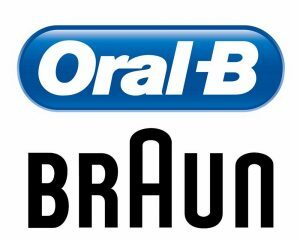 Braun, a Gillette Group enterprise, rebranded Oral-B for the next-gen electric toothbrushes that they started to produce later. David Giuliani was an entrepreneur with a degree in electrical engineering. In 1987, he met with Dr. David Engel and Dr. Roy Martin, two professors from the University of Washington. The trio formed and incorporated a new company, named GEMTech. GEMTech started to promote a new oral care device that used to have a piezoelectric transducer. After exactly five tears of researching and prototyping, the trio finally was able to launch Sonicare toothbrush in November 1992. Three years later, GEMTech was rechristened as Optiva Corporation and Optiva Corp was acquired by Phillips in 2000. 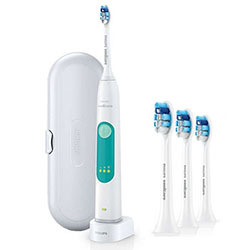 By 2001, Sonicare became the best-selling rechargeable electric toothbrush in the US and Phillips rebranded the product as Philips Sonicare in 2003. 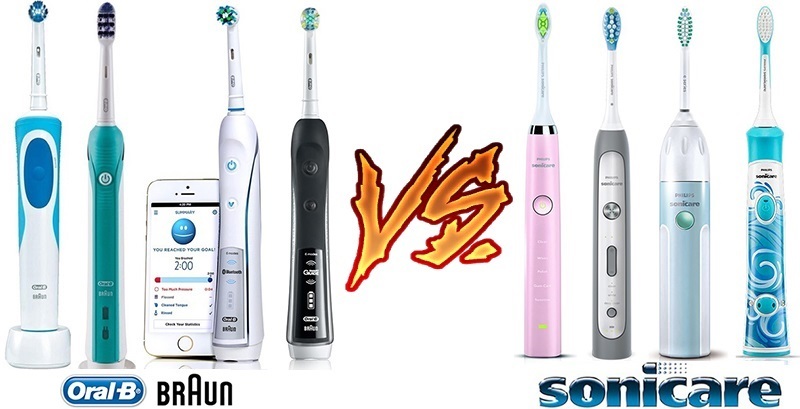 Oral b vs. Sonicare! Which one is the best choice? Almost all the Sonicare and Oral-B products on Amazon are highly rated by users and hygienists. Therefore, none of the two is the clear winner in this endless debate. It all boils down to personal choices and preferences. 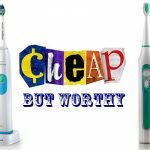 However, if you are more concerned with price and you think you can handle all the fancy features, you should go for an Oral-B brush. On the other hand, if you love simplicity and you are ready to sacrifice your dollars for some performance packed with it, go for the Sonicare products. Whatever you do, do not forget to read the reviews of real users. Both the Oral-B and Sonicare products are far more superior performers than the manual toothbrushes. To date, many research studies have been conducted on both the brushes. However, if you are low on budget but you want to switch from manual to electric, Oral-B products are more suitable for you. You should not but electric toothbrushes without reading expert reviews and user reviews. Go on Amazon to find more about the best-selling Sonicare and Oral-B products. Talk to your dental practitioner if you are in doubt.